We thought we'd share some of our FAQs so you know what to expect before you visit us whether you’re sharing an intimate meal or celebrating a special occasion. Q: Do you have outdoor dining? A: We have two patio options, both patios give outstanding views of the Boston Harbor. As long as weather permits, we serve both dinner and lunch with a view! Q: Are you affiliated with the Boston Winery? A: Yes, and it's located right next door. Our own wines are amongst the choices we offer in the restaurant and lounge. Contact the winery for information regarding tours and tastings. Q: How long has Venezia been open? A: We’ve been owned and operated by the same family for 32 years. In 2013 we remodeled the restaurant and our beautiful ballroom was renovated in 2016. Q: Can we dock our boat in the Boston Harbor alongside the venue and come in for lunch, dinner, or drinks? A: You sure can! The first 150 feet outside dock are available to our patrons on a first come first serve basis. Q: Do you offer a specific bar menu? A: You can dine in our lounge and order any items from the regular menu. You might enjoy some of our appetizers and lighter fare such as tuna tartar, calamari, and crab cakes. Our cocktail menu has signature drinks that capture the flavors and feeling of each season. Q: Do you ever have live music? A: Our customers love to come for the live music and dancing on Friday and Saturday nights from 8-midnight. We have hosted a variety of musicians as well as a DJ. Q: Can we hold a smaller function in the restaurant or do we need to reserve the ballroom? A: Our more intimate Waterfront Room of the Restaurant is a perfect venue for a smaller affair such as a birthday, anniversary, or even a corporate event, and seats 50-100 people. Check out our Restaurant Events Menu. Have a wedding or even larger event? Our spectacular ballroom seats 350 people and is the perfect setting for any celebration. Q: Is parking available or will I have to find a spot on the street? A: Venezia has a large parking lot that’s free of charge. We also offer valet parking Friday and Saturday nights. Q: What are some things that you’d say you’re known for? A: People know us for our fresh pasta, and seafood lovers keep coming back for our 2.5 lb. lobster. Our most popular dessert is probably our pastry chef’s renowned tiramisu, but we also like to tempt you with our decadent and delicious Berry Shortcake, topped with fresh berries and homemade whipped cream. Besides our food, Venezia is definitely known for its spectacular view. We’re the only Boston restaurant to make Open Table’s “100 Most Scenic Restaurants in America” list for 2017. Q: Do you offer specialty menus such as a kids’ menu or a gluten free menu? A: Since everything is made fresh from scratch, it allows us to be able to make substitutions and cater to your dietary restrictions, so we can make it the way you like! We also offer kids’ options such as chicken fingers and our amazing spaghetti with meatballs. 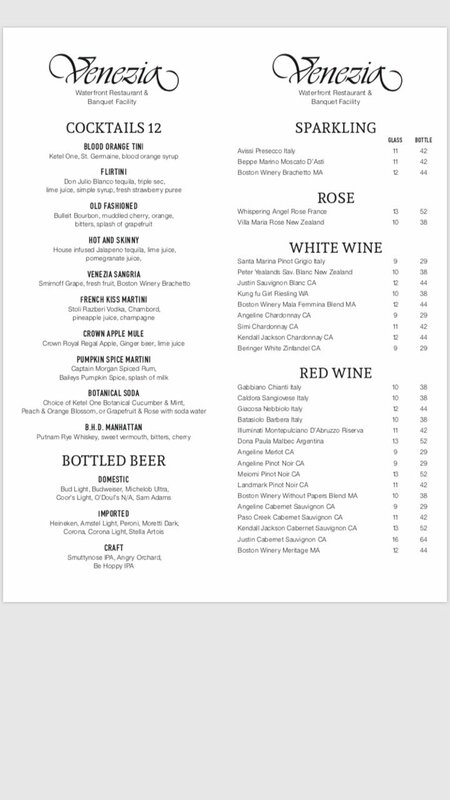 Check out our full menu for lunch, dinner, dessert, and wine list. We hope that you’ve enjoyed learning more about Venezia. We’d love to hear from you with any other questions you might have, and look forward to serving you. Join us! Venite a mangiare da noi!